Baton Rouge, LA. 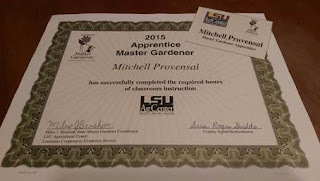 - Mitchell Provensal is one of our newly trained Master Gardeners for the Eradicating Food Deserts through the Development of School Gardens project. 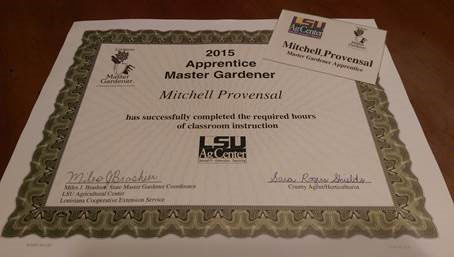 Mitchell attended the course in Pointe Coupee Parish through the LSU Ag Center. “I just wanted to thank you again for giving me a spot in the Master Gardener course. We had a graduation ceremony last night and I will be an official Master Gardener once I complete my 40 volunteer hours! It was a really great experience and each class was loaded with information. I really appreciate it!” said Provensal. Tiffany Franklin, Project Director, Eradicating Food Deserts through the Development of School Gardens project. Stephanie Elwood, Extension Associate, Community Gardens. The Louisiana Master Gardener program is a service and educational activity offered by the LSU AgCenter. The program is designed to recruit and train volunteers to help meet the educational needs of home gardeners while providing an enjoyable and worthwhile service experience for volunteers. Experienced and beginning gardeners seeking up-to-date horticultural information can advance their gardening expertise and gain self-satisfaction through volunteer efforts. The volunteer aspect of the Louisiana Master Gardener program allows individuals to dedicate their time and talents to enhancing the quality of life for citizens of their community by using the science and art of horticulture. It allows individuals to put into practice what they know and learn. Full details are available at http://bit.ly/1QUzyCy. Baton Rouge, La – In 1951, Lutrill Payne Sr. filed suit against Louisiana State University, which led to the desegregation of LSU’s graduate school. On Dec. 18, 2015 the LSU College of Agriculture recognized Payne’s accomplishments by posthumously awarding him the LSU University Medal, LSU’s highest honor, during its December commencement ceremony. Payne, who passed away in 1999, was also a veteran of World War II and the first African American to run for public office in Natchitoches. 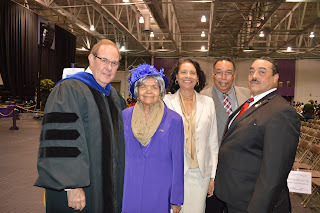 Payne’s wife of 59 years, 97-year-old Pearl Payne, attended the ceremony with her family and friends. Five years after the lawsuit, Pearl Payne received her graduate degree from LSU in education. Payne’s daughter, Carolyn Payne White, said the family was humbled and honored by this recognition. SU Ag Center Nutrition Educator for Ascension and St. James Parish, Lisa Weber (in red shirt on the second row), poses for a photo with the Nutrition and Foods class at St. James High School. Baton Rouge, La. 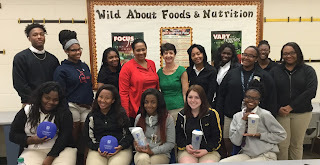 – The Southern University Ag Center’s Ascension and St. James Parish Nutrition Educator, Lisa Weber, discussed the principles of food safety and lean proteins at St. James High School. The presentation was held during Mrs. Rachel Schexnayder’s Nutrition and Foods class on December 2, 2015. Students participated in a class discussion and games testing their subject knowledge. The Nutrition and Food course is a part of the state funded, Louisiana ProStart Graduation Pathway– A JumpStart Program. The ProStart Pathway curriculum prepares 9th-12th graders for careers in nutrition and dietetics, food service management, food science and technology, hospitality and tourism and the culinary arts. Core courses include: Advanced Nutrition and Foods, Agricscience and Leadership Development, Baking and Pastry Arts, Meat Processing, Culinary Occupations, Food Science and ServSafe test prep. Upon completion of the curriculum, students will receive the National Restaurant Association’s ProStart National Certificate of Achievement and a ServSafe Food Protection Manager Certificate. For information on the Southern University Ag Center’s nutrition programs, e-mail ellen_mcknight@suagcenter.com or visit www.suagcenter.com. Southern University Ag Center Interim Chancellor, Dr. Adell Brown, Jr. The event was held on Friday, November 27, 2015 at the Milan Restaurant inside the Pere Marquette Hotel in New Orleans, LA. Southern University Law Center interim Chancellor Dr. John Pierre and Oschner Hospital’s Bill Oliver and Bobby Brown were also honored during the event. The Southern University System was also recognized for implementing the state’s first tobacco-free policy on all of its college campuses. 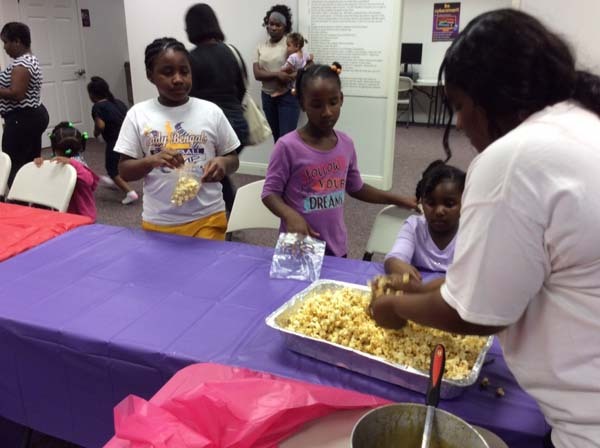 This tobacco-free initiative was spearheaded by the Southern University Ag Center’s Communities of Color Network. For the past 22 years The Network Coalition, which consist of both elected and appointed officials, community leaders and business representatives from across the state, has been honoring individuals from almost every walk of life. Past honorees have included poets such as Earnest Gaines, college presidents such as Xavier University’s President Dr. Norman Francis, business people, religious leaders and community activists. A spokesmen for the group said they saw 2015 as a “Year of Transition,” with the election of a new governor, new presidents at both the Southern University System and Grambling State University and new department heads on the horizon; they saw it fit to recognize these giants within the State of Louisiana. Dr. Brown has over 42 years of experience in higher education and agriculture, with 39 of those years at Southern University. He has served as interim Chancellor of the SU Ag Center since July 1, 2015 after being named to the position by the Southern University Board of Supervisors. Prior to his appointment, Brown held the title of Executive Vice-Chancellor and Vice Chancellor for Research at the Southern University Ag Center. He has held several positions within the SU Ag Center and the SU Baton Rouge campus. These positions included Adjunct Professor in the Department of Economics and Finance in the College of Business; Vice Chancellor for Finance and Administration at the SU Ag Center; Associate Specialist and Specialist/Extension Economist; Assistant Administrator and Specialist for Agriculture; Acting Administrator and Assistant County Agent for the Cooperative Extension Program at the SUBR campus. Dr. Brown also served as the Small Farm Coordinator for the College of Agriculture at SUBR. Apart from of his employment with the Southern University System, Brown has been Vice President for Research, Planning, Community and Economic Development and Tenured Associate Professor in Business for the College of Business at Mississippi Valley State University; Program Manager for the USDA’s Cooperative State Research Services Office of Small-Scale Agriculture in Washington D.C.; USDA Visiting Professor for Farmer Home Administration and Research/Teaching Assistant for the Department of Agricultural Economics at Louisiana State University. Congrats to Ag Student Marshall Sally Ross! Baton Rouge, La. – Southern University Baton Rouge awarded diploma to nearly 500 graduates during its fall commencement exercises, today, Dec. 11. The fall 2015 Class included 310 undergraduate and 184 graduate candidates for degrees. 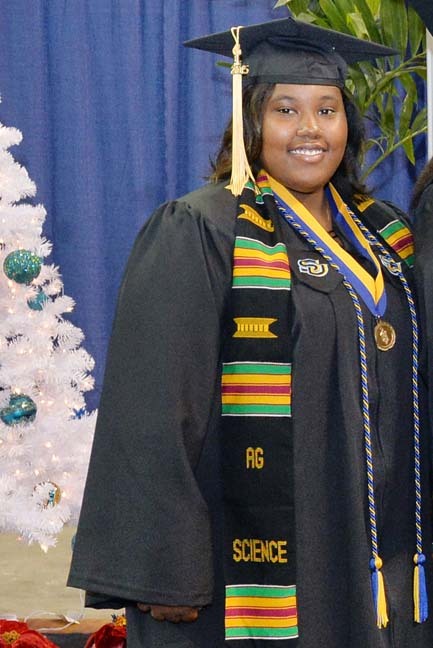 The chief student marshal for the College of Sciences and Agriculture was Baton Rouge native, Sally Demetris Nicole Ross. During her senior year, August 2015, Ross was selected to be a 2015 HBCU All-Star Scholar by the White House Initiative for Historically Black Colleges and Universities (HBCUs). The SU Ag Center congratulates Ms. Ross for a job well done! The commencement speaker was Louisiana Governor-elect John Bel Edwards who was elected Louisiana's 56th governor in November. Edwards will take office Jan. 11, 2016. Southern University System President/Chancellor Ray L. Belton presided and conferred degrees, along with University deans, to the candidates. Baton Rouge, La. – Agriculture Secretary Tom Vilsack has announced the availability of $17.6 million in funding to support research and outreach activities that will help growers, producers, and processors find innovative ways to improve organic agriculture. The grants are being funded through the Organic Agriculture Research and Extension Initiative (OREI), a program that is administered by USDA's National Institutes of Food and Agriculture (NIFA) and authorized by the 2014 Farm Bill. "Over the past six years, USDA has strengthened programs that support organic producers as they grow, thrive and respond to increasing consumer demand for organic products," said Secretary Vilsack. "The projects funded through the Organic Agriculture Research and Extension Initiative will help identify innovative solutions to critical challenges facing organic agriculture, ultimately strengthening local markets, improving rural economies and expanding access to healthy food for Americans." Applications are due March 10, 2016. Please see the request for applications for specific program requirements. Baton Rouge, La. – The Southern University Agricultural Research and Extension Center is pleased to announce the two winners of its first Outstanding Customer Service Award. The winners are Angela R. Jackson, Administrative Assistant IV in the Office of the Vice Chancellor for Extension and Curtis Chisley, Research Associate and Interim Livestock Show Director. “It is with great pleasure that the Southern University Agricultural Research and Extension Center announces the 2015 Outstanding Customer Service Award recipients,” said Dr. Adell Brown, Jr., Chancellor of the SU Ag Center. “As the outreach arm of the Southern University System, the staff of the SU Ag Center are the individuals who work directly with the citizens of Louisiana and it is important that we honor these staff members who have gone above and beyond to assist and ensure our clientele have a rewarding experience,” added Dr. Brown. Both Jackson, who has been employed by the SU Ag Center since 2004, and Chisley, who has been employed since 2006, will be honored during the Center’s 2015 Scholarship Gala themed, “Sowing Seeds for Future 1890 Scholars: Growing the Next Generation,” which will be held at 8 p.m. on December 17 at the L’Auberge Baton Rouge Casino & Hotel. Each recipient will also receive two tickets to the gala and a $150 monetary award. The 2015 Outstanding Customer Service Award was open to any full-time staff persons employed by the SU Ag Center and/or has an appointment with the Center for at least three years. Staff members were nominated for the award by their fellow co-workers through an application process that included the submission of a completed nomination form, a letter of recommendation and a written statement describing how the nominee demonstrated a positive attitude and their outstanding customer service performance. Baton Rouge, La. - The U.S. Department of Agriculture (USDA) will host the 92nd Annual Agricultural Outlook Forum in Arlington, Va. on Feb. 25-26, 2016. The theme for this year's forum is "Transforming Agriculture: Blending Technology and Tradition." The challenges and opportunities for agriculture and rural America are changing. In 2015, American farmers persevered in the face of drought and an unprecedented animal disease outbreak. Demographics are also changing in rural America and across farm households. Meanwhile, technology is rapidly opening new applications for producers and throughout the marketing chain, and new markets are emerging for U.S. agricultural products. USDA continues to seek out new and innovative ways to expand opportunity and provide support for America's farming families, and that mission will form the basis for the 92nd Agricultural Outlook Forum. USDA Chief Economist Robert Johansson will present "The 2016 Economic Outlook for Agriculture." The Forum's keynote address will be delivered by Howard Buffett, CEO of the Howard G. Buffett Foundation. Mitch E. Daniels, Jr., President of Purdue University and former Governor of Indiana will be the dinner speaker. USDA has hosted the Agricultural Outlook Forum since 1923. It is USDA's largest annual meeting, attracting 1,600 attendees last year. It serves as a platform to facilitate conversation of key issues and topics within the agricultural community, including producers, processors, policy makers, government officials and NGOs, both foreign and domestic. The two-day meeting will be held at the Crystal Gateway Marriott Hotel in Arlington, Virginia, Feb. 25-26, 2016. To view information about the Forum and to register, go to www.usda.gov/oce/forum/. Baton Rouge, La. – Did you know that 2015 is the year of the soil? Griffith Observatory curator joins USDA Healthy Soil Campaign. View video here. Kentwood High School "Battle Rapped" winners, from left are: Corey Moore, second place winner; Lil' James Gibson, third place winner and Cornelius Moore, first place winner. Baton Rouge, La. – There is an old adage that says, “Music expresses that which cannot be put into words.” On December 1, 2015 this statement was backed by three lyricist at Kentwood High Magnet School as they “Battle Rapped” during the Southern University Agricultural Research and Extension Center’s, “Dream big! End it,” World Aids Day Events. Contestants were challenged to develop an artistic piece, which would bring awareness to their peers about ending the HIV/AIDS Epidemic. Over 200 students filled the Kentwood High School gym anxiously waiting to cheer on their favorite rapper. AIDS Healthcare Regional Coordinator, Sashika Baunchand was on hand to educate students about the startling statistics on HIV/AIDS cases that were just released this week. According to the Centers for Disease Control and Prevention, Louisiana ranks number four in the United States. There were many short gasp taken as statistics were being read. However, national television host and Comedian Tony King was on hand to shed truth and light on this taboo subject. King reiterated that these statistics are not shared to scare them, but to help them make sound decisions when it comes to things that can ultimately affect their future. Gifted & Talented Visual Art Students at St. Helena College & Career Academy also tapped into the arts in putting an end to this AIDS epidemic. Shy’Janae Hookin, Javier Smith, Leroy Harris, Chris Galmon, and Teanna Lee were honored during the, “Dream big, End it,” Social Change Mural Unveiling Ceremony. These students where challenged to paint a social change mural that will bring awareness to dreaming big, and ending HIV/AIDS. Baton Rouge, La. 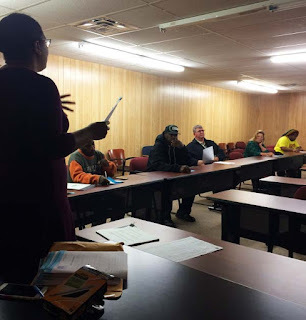 - On December 3, 2015, Krystle Washington, SU Ag Center Extension Educator, began a community development initiative of providing free professional résumé writing workshop to community members. The class was a major success, and laid the blueprint for multiple classes to follow. “I went into the workshop thinking that we would only work on a professional résumé but I subsequently had to help create professional email addresses as well, I know to add that into my lesson plan in the future,” said Washington. Workshops at the Vermillion Parish Business and Career Solution Center (Vermillion Acadiana Works, Inc.)/South Louisiana Community College-Gulf Area Campus in Abbeville Parish will begin on January 9th, 2016. The workshops are free and open to the public. However, participants are urged to pre-register at their area Business and Career Solution Center. 4-H L.I.F.E participants paint a jaguar during the program's 'Painting with a Twist' event on Nov. 18 at the Southwest Center for Rural Initiatives. Baton Rouge, La. – On November 18, 2015 the 4-H L.I.F.E. 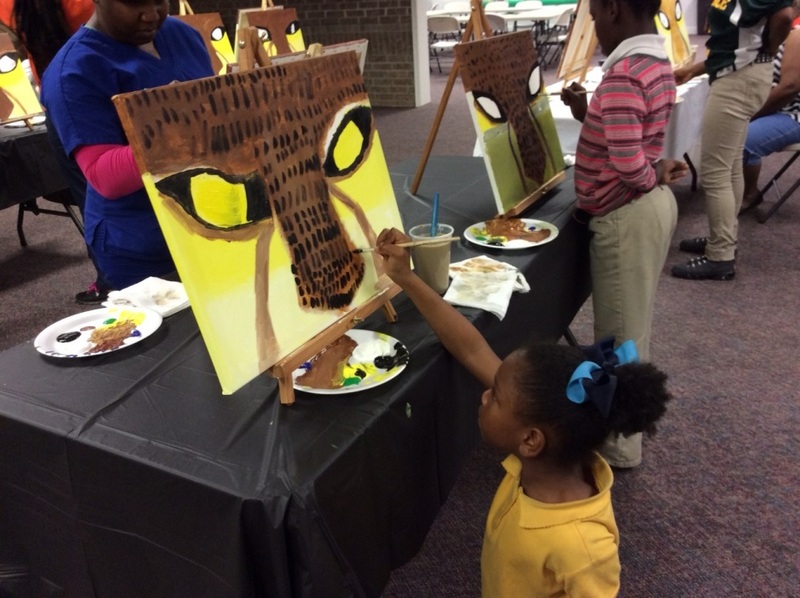 (Living Interactive Family Education) program hosted its 'Painting with a Twist' event with Mrs. Rachel Jenkins with By You Painting. Sixteen youth ages 8-15, along with five parents and five mentors, painted their own unique versions of jaguars which included the 4-H clover. The event, which was held at the Southwest Center for Rural Initiatives in St. Landry Parish and led by Program Site Coordinator Stacey Nevills and Program Assistant Damien Papillion, engaged youth of incarcerated parents who are active participants in the 4-H LIFE program. The youth enjoyed pizza and punch for refreshments. This event is part of the monthly group mentoring activities for the ‘Changing How I Live Life’ (C.H.I.L.L) component of the project. Tiffany Wilkerson-Franklin is the 4-H L.I.F.E. project director at the Southern University Ag Center. Stacey Nevills, Program Site Coordinator, along with her assistant, Damien Papillion, hosted the event. Tiffany Wilkerson-Franklin is the 4-H L.I.F.E. project director. Baton Rouge, La - Agriculture Secretary Tom Vilsack has reminded farmers and ranchers that the next general enrollment period for the Conservation Reserve Program (CRP) begins today, Dec. 1, 2015, and ends on Feb. 26, 2016. December 2015 also marks the 30th anniversary of CRP, a federally funded program that assists agricultural producers with the cost of restoring, enhancing and protecting certain grasses, shrubs and trees to improve water quality, prevent soil erosion and reduce loss of wildlife habitat. Click here for full bulletin. As of September 2015, 24.2 million acres were enrolled in CRP. The CRP also is protecting more than 170,000 stream miles with riparian forest and grass buffers, enough to go around the world 7 times. For an interactive tour of CRP success stories from across the U.S., visit www.fsa.usda.gov/CRPis30, or follow on Twitter at #CRPis30.